The arrival of a fresh, unpasteurised tank of Pilsner Urquell, directly from the Czech Republic brewery, is more than enough reason for lager lovers to regularly gather at Stockholm’s ‘tankovna’ Bar Central. The tank bar – restaurateur Robert Rudinski’s second Stockholm venture – centres around two horizontal 500 litre stainless steel tanks that, with the addition of a countertop, doubles as a bar. 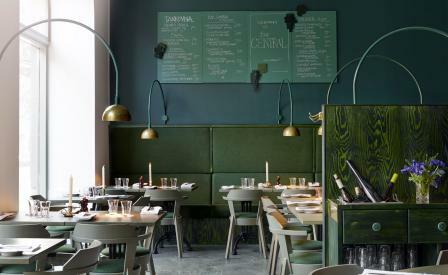 Architect Frederik Stenberg and artist Jonas Nobel of local design office Uglycute, envisioned a space with diversity, ranging from a slightly rowdy communal table to a set of reclusive dining booths. Aside from the menu that features Central European specialties such as ’spätzle’, ’wienerschnitzel’ and ’lángos’, customers will recognise the deep green colour used throughout the interior from its sister outpost, as well as the zigzag floor pattern, which has this time been applied to the ceiling.